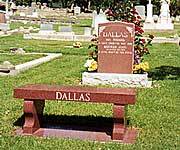 Bertram John Dallas, 81, passed away February 27, 2000 at his home in Napa, California, of cancer. 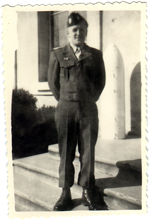 John was a native of San Francisco who entered active military service in 1938 from the National Guard. 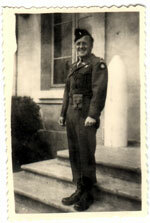 He fought in World War II, at Anzio beachhead, jumped with the 82nd Airborne in Holland, fought in the Battle of the Bulge, and in the Korean Conflict, where he was awarded the Silver and Bronze stars. Upon retirement from the U.S. Army in 1963, he continued college for a Bachelor's degree in Vocational Education and a Master's of Science in rehabilitation counseling. He held numerous teaching and counseling credentials. John taught in the Napa Valley Unified School District Experimental Forest, and at Napa and Solano colleges. Upon moving his family to Mt. George Avenue in Napa, Calif., he turned this one-and-a-half acre horse pasture into what is today "John's Rose Garden." He eagerly greeted hundreds of visitors every rose blooming season when the garden was opened to the public. On May 6th following John's passing the garden was open to the public once more in his honor and memory. The event was such a success John's family decided as long as the garden could be kept up that there would be a "Memorial Open Garden" one day each year around Mother's Day. Unfortunately after the passing of John's wife in December of 2010 this annual tradition is now over. 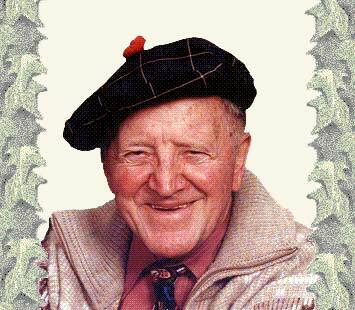 Many fellow rose lovers, friends and family members attended the services for John, which were held March 3, 2000 at Treadway and Wigger Funeral Chapel in Napa, Calif. All attending agreed that the Rev. Kenneth Stuckey of Napa Valley Evangelical Free Church did a wonderful job officiating. Interment was private in the family lot at Tulocay Cemetery also in Napa, Calif.
<=== John's Rose Garden & Napa Valley Estate for sale. John's Family ~ The loved ones left behind that miss him. Napa Valley mourns death of its ubiquitous rose gardener ~ March 3, 2000 article in The Napa Valley Register on John Dallas' passing. Donations ~ If you wish to pay your respect to John Dallas any help you can offer with gardening would be appreciated or you can contribute to the scholarship fund that has been established in John's name at Napa Valley College.